We're catching up on trip reports during a break between tours. Here's one from a wonderful, short South Africa trip from last November. We also posted a photo gallery. It was a 10-day road trip loop from Johannesburg, to Wakkerstroom, through Kruger National Park to Magoebaskloof, and back to Johannesburg via the Kalahari scrub north of the metropolis. We tallied 388 species of birds and 47 of mammals--a very successful trip! Below is the trip report's introduction--click on the link above to read the whole thing and see the trip's bird and mammal lists. South Africa in early summer is bursting with animal life. Birds’ breeding season is kicking into gear, migrants are pouring in, and birdsong is at its peak. 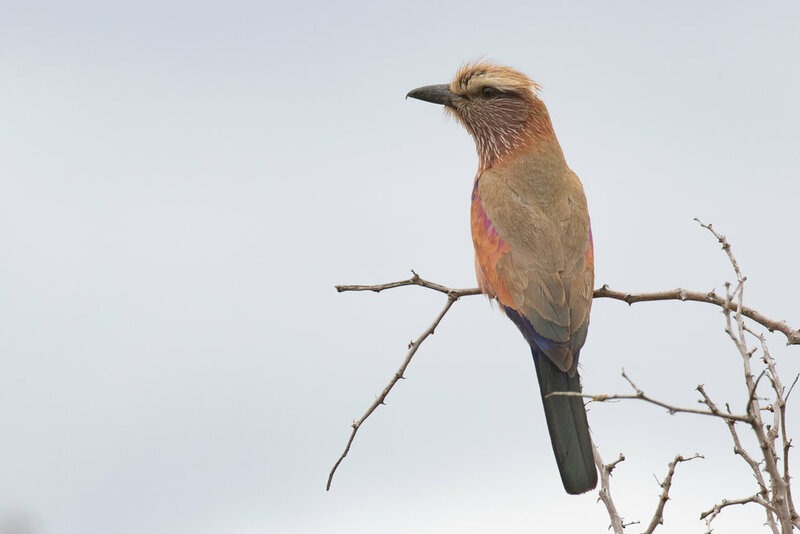 This itinerary was designed as a driving loop starting and ending at the international airport in Johannesburg, taking in some the best birding spots in the region along the route and the visiting a wide diversity of habitats full of endemic birds and other wildlife. In just ten days we packed in some of the finest grassland, bushveld, and forest birding the country has to offer, racking up 388 species of birds, including almost all of the top birds on the route, along with an amazing 47 species of mammals. It was a great introduction to African birds, animals, and experiences for the group, none of whom had been to Africa before. Among the bird highlights were Botha’s, Rudd’s, and Short-clawed Larks, Yellow-breasted Pipit, Bush Blackcap, Southern Ground-Hornbill, all five of the endangered vultures possible on the route (among 27 species of hawks, eagles, and relatives), Cape Parrot, Gurney’s Sugarbird, Wattled Crane, Bat Hawk, Green Twinspot, Black-fronted Bush-Shrike, African Crowned-Eagle, seven species of bustards, and excellent numbers of migrants.